Jabar Gaffney was a talent who left it all on the field for the Florida Gators back in 2000 and 2001. In both years he had almost 1200 yards and over 10 TDs receiving. He declared for the 2002 NFL draft and was selected at the top of round 2 by the Houston Texans expansion squad. It was expected that Gaffney would become young quarterback David Carr‘s preferred target as they’d grow together as an up and coming talent. Among receivers looking back, his selection was a fair one. He’d finish 2nd in total WR yardage in an otherwise lackluster class. Jabar caught only 1 TD his rookie season, in a week 6 snoozer against the Buffalo Bills. The following week he’d record his first and only professional TD throw against the Cleveland Browns. In total that rookie year, Jabar had 483 yards on 41 catches. Later in 2004 Gaffney had his best season as a Texan with 632 yards on 41 receptions. 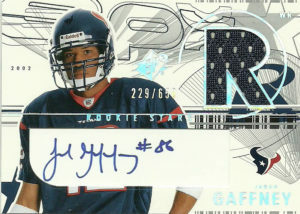 In 2005, the Texans experimented with utilizing Gaffney as more of an inline receiver. He’d make 55 receptions, but as David Carr regressed, so did the Texans record. The entire team from the front office down was fired and a new regime was brought in. Jabar was a free agent. Gaffney found a home with the Philadelphia Eagles, but was a surprise cut before the beginning of the season. He’d then sign with New England where he’d play for the Patriots over the next 3 seasons. In 2007 he’d have a career high 5 TD receptions. Jabar then signed with the Denver Broncos in 2009. In two seasons with the franchise he’d post near career highs in receptions (54, 65) and yards (732, 875). He’d be headhunted by the Redskins for 2011, again posting career highs in receptions (68) and yards (947) and tied his career high with 5 TDs. Jabar returned to the Patriots, but was cut shortly there after. He later signed with the Dolphins, but ran into legal trouble. Miami cut him and Gaffney was unable to resuscitate his career. In 2016 he was arrested in Jacksonville for marijuana. Gaffney has attempted to remain low key otherwise, despite some run ins with the law.